Yes, jackets, tees and the other cornerstones of your wardrobe are important, but do any of them take the daily battering that your shoes do? If you’ve invested in a decent pair, it pays – in more ways than one – to look after them properly. Here, we show you the best way to care for your footwear – from cleaning and polishing, to spotting the early signs of shoes that need to be fixed. If you’ve ever shelled out a tidy sum for a quality pair of leather shoes, you’ll know that they need cleaning even when they’re not especially dirty. So, the first step in caring for leather shoes is regularly removing dust and light surface debris from the uppers with a horsehair brush. If a light dusting isn’t enough to remove whatever has worked its way on to your shoes – i.e. if they’re ingrained with dirt, or you simply want to prep them for a thorough polish – then you will need to wash and condition your shoes to remove any sediment lying underneath the surface of the leather. 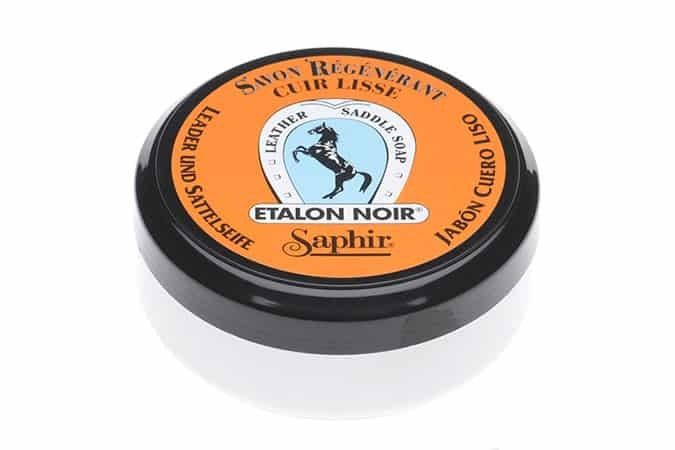 We recommend investing in a saddle soap, such as this one from Saphir, which will effectively remove successive layers of wax from previous polishes without stripping or damaging your best brogues. To clean, start by putting on a pair of gloves and prepping your cleaning space by laying down some newspaper. Then, dip a soft sponge into water to wet slightly and gently work up a lather of the saddle soap on the surface of the shoe. Once clean, leave your shoes to dry at room temperature and avoid the temptation to use heat – this might speed up the drying process but it will also dry out and damage the leather. Next, you’ll need to condition your shoes so as to soften and moisturise the leather and help prevent it from cracking. You should apply a conditioner to your shoes whenever you feel the leather is getting dry, but this is something of an acquired skill and it’s not always so easy to determine – a general rule is to condition every five to ten wears in hard conditions, and every fifteen to twenty-five otherwise. Invest in a soft cloth and buff a little of the conditioner into the shoes in small layers using tight, circular motions. Once the entire surface of the shoe is treated, take care to wipe away any excess product. This might seem obvious but better safe than sorry: make sure you match the colour of your polish to the colour of your shoe – for example, oxblood Derbies should be shined with burgundy wax. Much like conditioner, shoe polish should be applied in small, gradually layered amounts using a horsehair brush or cloth moved in concentric circles with mild pressure. We suggest you opt for a wax-based polish, which will add some pigment to the shoes (enriching their colour), provide all-important protection and enhance the smoothness of the finish. Wax polishes also give you a better chance of achieving that perfect military-standard, mirror-like shine on your dress shoes. Bull shining (or spit shining as you’ll probably better know it) is the old-fashioned yet surprisingly effective technique commonly used to give a high shine finish to dress shoes. If you’d prefer to take this more economical route, then find a soft rag, stretch it over your index and middle finger, twist the loose ends of the cloth until the material is tautly stretched over the fingers, and hold. Then, apply a few drops of water to your rag-swaddled fingers and rub gently on the same spot until you feel a hardening of the wax; with a good bit of elbow grease, a decent shine should begin to appear. If the wax still remains soft and you still cannot feel any change, wait for thirty seconds, apply another few drops of water and re-work the same spot. When a shine has appeared in one spot, move on to the next until the entire shoe is gleaming. As a general rule, it’s good practice to strip the excess wax polish from your dress shoes every three to six months, then condition and rebuild. “Leather needs nourishment,” says menswear stylist Daniel Johnson. “So, you need to keep adding nourishing cream and polish. After around twelve to fifteen wears, your shoes will develop a wonderful patina specific to your foot’s movement and the leather itself. Taken our advice and invested in a pair of suede loafers or Derbies/brogues for the coming season, but don’t know how best to keep them in prime condition? First up, given suede’s sensitive disposition, you’ll need to ensure your shoes are properly weatherproofed before you take them for a spin on the pavement. Begin by applying a silicone-based suede protector spray (again, ensure it’s a good colour match) to the suede-covered areas of the upper and then leave them to absorb the protectant overnight. Also worth adding to your care kit is a cleaning block, for removing stubborn stains, and quality suede brush – both are relatively inexpensive and can be picked up at most shoe shops. A suede brush features a small wire implement and bristle that helps keep the fabric’s natural nap; brush your shoes with your suede brush after every use, this will revive the nap and remove any excess surface dirt that may have accumulated. Unlike leather, you should never apply topical products to suede, as doing so will disrupt the fibres and leave your sleek desert boots looking decidedly dog-eared. 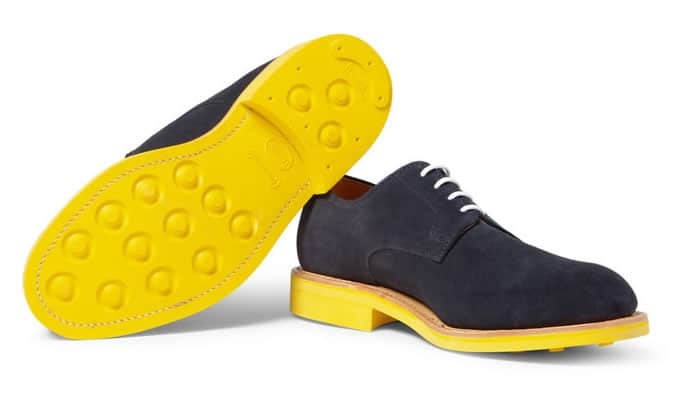 Yet no matter how painstakingly careful you are in avoiding products, freshly cut grass or pet excrement, the British summertime poses a constant threat to suede footwear. If you do get your suede shoes wet, remove any excess liquid by dabbing with a towel and allow them to dry naturally overnight. Once they’ve dried, lightly brush the nap in its natural direction to restore your shoes (as close as possible) to their original best. If your suede shoes encounter grease spots (the perils of BBQ season), a good tip is to rub a small amount of talcum powder into the stain and leave to dry for several hours. This will effectively absorb the moisture, so when you come to brush the shoes again, both the talc and the grease should be easily removed. Shoe trees are an important investment for any man who takes his footwear collection seriously. These nifty accessories will allow your recently worn shoes to contract and dry out to their ideal shape – but only if you choose the right style. Varnished trees may look swish in your wardrobe, but they won’t properly draw unwanted moisture out of the leather. Much more effective are unfinished cedar trees with a split toe and a fully shaped heel, as these will ensure the closest possible fit between shoe and tree. And before you start loading up your online shopping cart with enough shoe trees to decimate a forest, remember that you really don’t need more than one or two pairs. The optimal time for using a shoe tree is actually the hour or two after you have removed the shoes from your feet. After this time, the shoes will have returned to their natural architecture and the trees are, essentially, useless. Boots should be stored upright using boot stands – if the tongues fall forward, they could end up with a permanent crease after a few months of storage. Leather shoes should be stored in shoe bags – these will help shade the shoes from light that can damage leather and will also keep your shoes free from dust. Plastic bags will keep your shoes moisturised and help prevent them from drying out. Store suede shoes in open air (but not in direct sunlight) – unlike some types of footwear that can be stored easily in plastic containers, suede requires exposure to air in order to breathe. Sports footwear should be stuffed with newspaper to retain the shape and absorb excess sweat – just make sure it’s acid-free paper and avoid using newsprint, as it could discolour your shoes. No matter how good you are to your shoes, regular wear will eventually take its toll, so you might find that you need to get your shoes resoled. Many reputable shoe brands (Russell & Bromley, Grenson, Barker, Loake, John Lobb, Red Wing, etc.) will offer an in-house service that you can utilise when your footwear’s in need of some first aid. However, if this is not an option, you’ll want to find yourself a good, local cobbler with an expertise in men’s footwear. A true professional will be able to accurately identify the problem with your shoes, talk you through how best to repair them, and also give you plenty of tips on how to best prevent the same issue recurring. Any cobbler worth their salt will not only be able to apply half- or full-leather stitched and rubber soles, but also conduct heel repairs, apply toe taps, re-welt shoes, replace zips and even stretch shoes that are too tight in their fit. The amount you pay to get your soles replaced will vary but be prepared to part with around £25 for stick-on soles, £40-£50 for leather soles and £20 for re-heeling. Fallen out of love with your footwear? No matter, there are a couple of ways to freshen them up so they become your favourites once more. One of the quickest fixes is to replace your shoes’ laces. A standard pair of brown brogues can be updated for the coming season with a pop of colour by threading through red or mustard laces in place of the tonal pair they probably came with. For a slightly bolder update, you could dye the leather of your shoes, although don’t take this decision lightly, since the products are permanent and any mistakes are irreversible. Ahead of dying, make sure you remove the laces and strip all old polish and residues from the uppers using saddle soap. Next, carefully apply a liquid shoe dye (such as Teinture Francaise) with gloved hands to the leather using an applicator brush. Leave the dye to dry, review the results, and then repeat if the colour shows patching or if you want to improve the richness of the colour. Finally, condition and polish your shoes as usual. Keeping your shoes looking great isn’t as taxing or expensive as you might think – treat this article as your go-to care manual next time you invest in a timeless pair, and see just how much further your footwear can go. What are your tried and tested shoe care tips? Share your thoughts and feedback by commenting below.